While a guest at Casa Escondida Bed & Breakfast, we encourage you to partake in the “Historical Downtown Walking Tour” in Santa Fe. Casa Escondida is a Santa Fe area Bed & Breakfast, which is located in historic Chimayo, NM (just 35 minutes north of Santa Fe). Santa Fe is a common day-trip destination for our guests at Casa Escondida B&B. 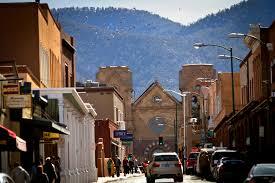 This Historical Downtown Walking Tour is one of the best tour values in Santa Fe, New Mexico! The Historical Downtown Walking Tour is offered by the New Mexico History Museum. From mid-April through mid-October, you can learn about the fascinating (and often surprising) history of Santa Fe when you take the guided walking tour. The Historical Downtown Walking Tour is led by a fun and well-informed New Mexico History Museum docent or a Palace of the Governors docent. 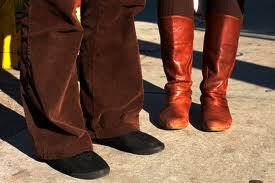 Wear your comfortable walking shoes and get ready to be entertained and amazed. These guided tours are offered Monday – Saturday at 10:15 AM only. The only times that these tours are NOT offered are on days when there are large events on the plaza (such as Spanish Market, Indian Market, Santa Fe Fiesta, etc). Meet on the sidewalk in front of the blue gate (it really is a large, blue, wooden gate) that is at the entrance to the outdoor courtyard at the Palace of the Governors. The blue gate is just south of the New Mexico History Museum entrance. The New Mexico History Museum is located at 113 Lincoln Avenue. The walking tour cost is only $10 per person. Bring the kids too because children that are 16 years of age and younger are FREE with a paying adult! Be sure to bring CASH to pay for your walking tour. No other form of payment can be accepted. This is paid directly to your tour guide when you meet at the blue door. No tour reservation is required. Museum guides do not accept tips and the funds from the Historical Downtown Walking Tour benefits the museum. So when you wonder about things to do in Santa Fe, put the Historical Downtown Walking Tour on your list. The Downtown Historic Walking Tour is a wonderful way to experience Santa Fe. Casa Escondida B&B is a delightful New Mexico retreat, which has rooms available year-round. We are perfect for a romantic New Mexico getaway too. Contact Casa Escondida B&B to check room availability or to inquire about a reservation. Casa Escondida Bed &Breakfast is a green bed & breakfast, which provides pet-friendly lodging in 4 of our 8 guest rooms. Enjoy your New Mexico travels AND the Downtown Historical Walking Tour in Santa Fe! We look forward to having you as our guest.